Posted on January 19, 2018 at 1:57 pm. Four separate robberies have taken place at four Las Vegas casinos in the past week, but local authorities have revealed they’re not connected. The latest incident took place at SLS Casino on Monday at 9am, where a man jumped over the counter, stole the money and ran off between the slot machines and out the door – a lot less sophisticated than an Ocean’s 11 heist. Although the incident left no US casino players hurt, bystanders did express concern at how easily the thefts occurred. The theft is the fourth to occur within a six-day period, with an armed robber stealing cash from behind a cage at the New York New York Casino last Wednesday. On the same day, three players stole chips from a table game at Harrah’s, while another armed robbery took place at the Ellis Island Casino on Saturday. Las Vegas Metro Police Department commented on the casino heists, stating that they do not believe they’re connected, though they’re investigating any links. Due to their policies, authorities have not released the total money/chips stolen since it could encourage future thefts. Security did not chase after the suspects in any of the incidents, which professor at the University of Nevada, Las Vegas, Mehmet Erdem has explained is standard practice. According to the professor, casino operators have to find the right balance with security being visible as it can make casino players uncomfortable. The amount of cash stashed at a land-based casino, combined with a lack of armed security makes these venues ideal targets, according to retired Las Vegas Police Lieutenant, Randy Sutton. Serving as Crime and Safety Expert for local television station KTNV, Mr Sutton said criminals feel they won’t face any consequences – low risk for a high reward. Security footage has not been released for the robbery at SLS, but the suspect was seen wearing a hoodie. CCTV caught the other three incidents on camera, and police are appealing to the public to come forward with any information about the crimes. You can play from the safety of your own home in the US and avoid any chance of being caught in the middle of a heist. Online casinos have all the same games as land-based venues do – slots, blackjack, roulette, etc., – except they run on computer software. Since the online casinos don’t have to pay staff like security guards, they can increase the return to player percentages on games, giving you a better chance at winning. 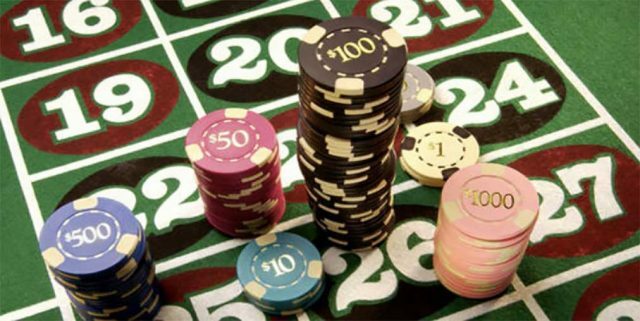 If you like the land-based ambience, you can also check out live dealer casino games at WildCasino, where the casino streams a dealer in real time to your device. For players from United States looking for online casino games, we recommend Bovada Casino.